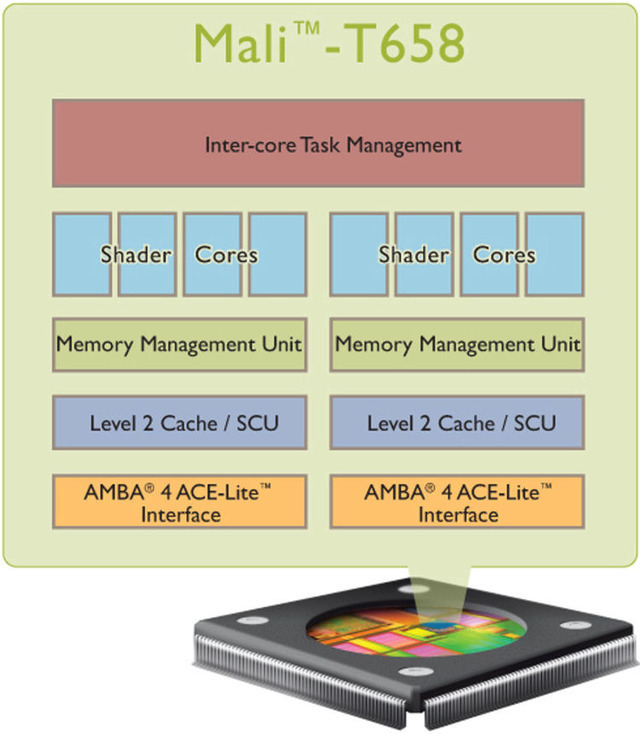 Chip designer ARM has announced its next generation mobile GPU, the Mali-T658. ARM boasts that the design will offer ten times the performance Mali-400 MP, found in, among other smartphones, the Samsung Galaxy S II. The T658 is ARM's second GPU using an architecture it calls Midgard. Midgard is designed to support both 3D workloads using modern APIs—it supports both OpenGL ES and Microsoft's Direct3D 11—and computation workloads using OpenCL, Microsoft DirectCompute, and Google RenderScript. To aid with compute tasks, Midgard supports full IEEE 754 floating point.